First of all, what is a mezzanine? Essentially they are a second floor level that you add to your warehouse to create another level of space. They are typically assembled out of structural steel are equipped with handrails and have metal grate, wood, or concrete flooring. What are the advantages to having a mezzanine? I’ve outlined 3 of the most important ones below. Number one, you have more space. More space for production, storage, or even office space. What you do with the space is up to you, but here are some suggestions. Outfit the mezzanine with shelving. You can put the shelving upstairs or downstairs, or you could double the footprint with shelving on the floor level and on the upper level. Build an office on top of the mezzanine. 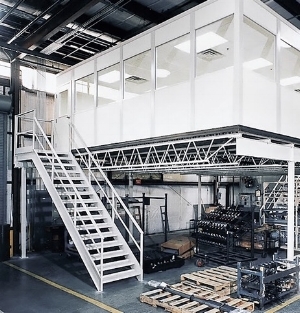 Modular offices are often installed on top of mezzanines where a production manager can have their own office space and have a view of the shop floor from up high. The floor level could be used for storage. They are customizable. You can build them to any specific height, square footage amount, and configuration. They are portable, which means you can relocate them if necessary. Mezzanines can be modified or extended. You can add onto your existing. Breweries are a good example for this. A lot of times the controls on large brewery tanks are up in the air. Instead of using a ladder every time the brew-master has to use the machine, they have a catwalk (mezzanine) installed so they have easy access to do their work. This catwalk application is used in many other types of manufacturing plants as well. Mezzanines allow you to acquire more space in your existing facility without having to lease out or purchase new space, which saves a ton of money. For example, I am local to Hampton Roads and as of August 2017 commercial real estate market calls for about $10.00 psf (per year) on average for a midsize industrial space. The average cost to get a new mezzanine installed is typically $40.00 psf. The math is fairly simple. The mezzanine pays for itself in 4 years. Along with the practical financial advantages, there are tax advantages as well. As a business owner you are able to depreciate the entire mezzanine cost over the course of 7 years. Compare that to 31 years for traditional construction. Take a mezzanine purchased for $30,000. The asset depreciates completely over a period of 7 years. Assuming a 34% tax bracket, the overall tax savings for the mezzanine would be $10,200. Over that same period of time on traditional construction, the asset would only have depreciated 21%. That’s tax savings in your pocket sooner. Mezzanines can be a great investment. If you are out of space they’re a lifesaver. If you have to grab a step ladder every time you go up to work on that one machine they’re a great solution as well. Whether it’s a mezzanine or any other piece of equipment spend a little time planning. Figure out what the application will do for you and how it will improve operations. Put a little thought into it. Come up with a plan and it will go a long way. Newer PostModular Offices: The Flexible and Cost Effective Solution.